Bring in more sidewalk sales with this full-color sign! Indicate that you’re open for business, advertise your daily specials, or alert passers-by to your special event with this sidewalk sign. Lightweight, portable design allows you to move your display wherever your target audience goes. The double-sided sign flexes in the wind on the spring-mounted frame. 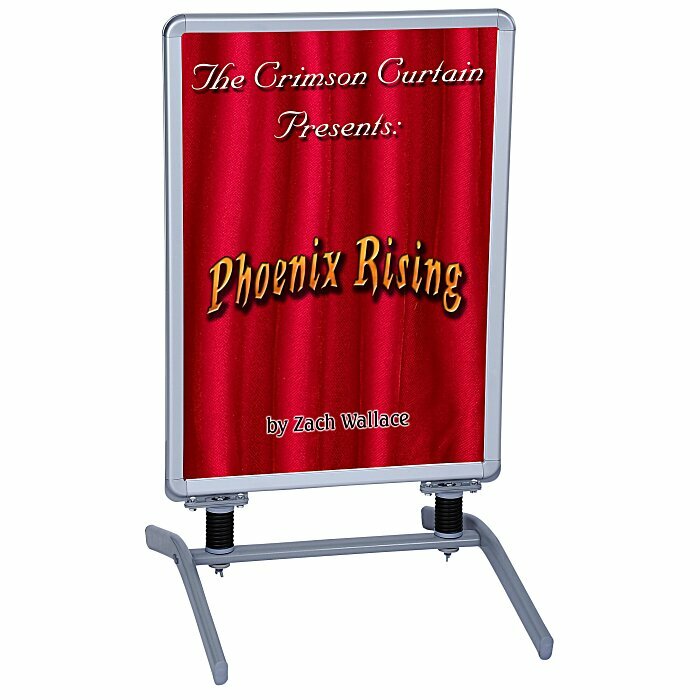 Durable frame and the two acrylic-covered banners withstand various outdoor conditions. Fuss-proof set-up and simple graphic changes allow you to manage your marketing with ease. Change out the graphics with each new event, sale or branding effort with the Flex Sign replacement graphics (item #113511-RGFour Season Flex Sign - Replacement Graphic). Size: 44" x 25-1/2" x 29"; weighs 27lbs. Your price includes a full-color imprint on the front and back of the banner.